Hundreds of thousands of small business owners are tossing and turning at night, trying to figure out how to attract more customers. They need to know how to sell, both individually and through their organizations. 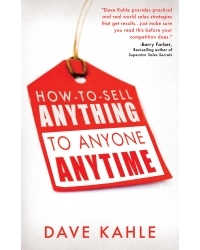 How to Sell Anything to Anyone Anytime was written primarily for them. • Easy-to-understand practices and processes that can be applied to every business and professional practice. • Guidelines and step-by-step how-to’s to turn ideas into practice. • Powerful insights on selling that will enable everyone—from the aspiring entrepreneur to the experienced sales pro—to be more successful. • Power nuggets—ways to add even more power to the practice and become even better.